Welcome to the second part of my scarf collection posts. Today I have two more small sized scarfs to show you. The first pochette (45x45cm) is called Circuit 24 Faubourg. It mentions the address of Hermès’ Paris flagship store of course, but the circuit part refers to a racetrack. The motives used are the famous Chain d’Ancre (anchor chain) that Hermès uses again and again in jewellery, porcellain designs, clothing and, of course, scarves. On this pretty little silk square the chainlinks are arranged to form a racing track of sorts. MaiTai has done a cute video about this scarf (although hers is a 90 in a different colourway) making this particular point clear. Here you see it tied. The small format also makes it ideal to use around the wrist as a bracelet, either covering a bangle or on its own. The second one today is a very special scarf in that it neatly ties (yes, bad pun!) in with my other love – perfume. 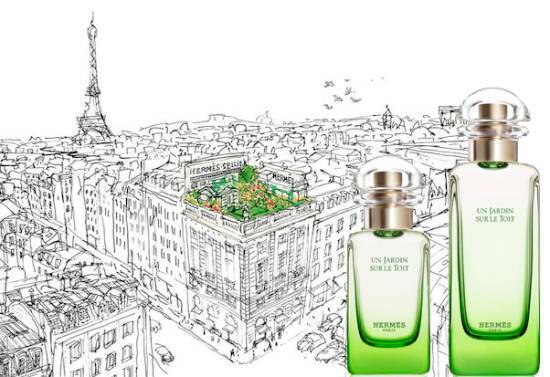 It is named exactly like the Ellena creation Un Jardin Sur le Toit which is part of Hermès’ Jardin series. 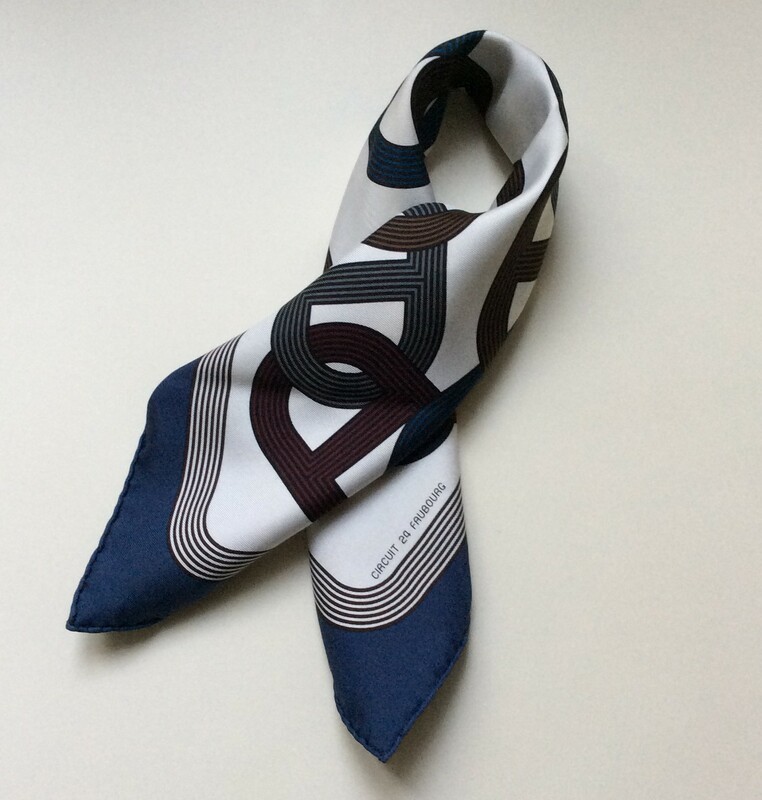 The scarf was initially released in tandem with the perfume and relaunched last year, where I snapped it up in Paris. You can see the lovely drawing on the scarf and the one on the box of Un Jardin sur le Toit are almost the same. I love how just the garden on the roof is coloured, thereby underscoring its escape from the city aspect beautifully. The story of this scarf is funny too. The Husband and I had a bit of a Hermès marathon behind us when we visited Paris last summer. At the airport, my lovely and indefatigable husband said he would go to the restrooms, when it truth he decided to check out the Hermès boutique at the terminal as a kind of last hurrah. He wanted to purchase a pochette, any pochette, to surprise me, then go back with me to exchange it to the one I selected for myself. How romantic (and wise! ), isn’t he? Only the problem was that the unimaginative SA in the shop would not let him do it. She insisted that she could not let me exchange the scarf later (which would have been only 5 minutes later!). What a cow! His surprise ruined, M came back moping a bit, but not defeated. This is Paris after all, and Paris has not one, not two, but three Hermès concessions at Charles de Gaulle airport. So on we traipsed to the next terminal where a lovely and friendly SA showed me Un Jardin Sur Le Toit in a few colourways. The light blue one was love at first sight. Happy End. Next week we’ll take a peek at the next size up, the vintage 70 silk. Stay tuned! 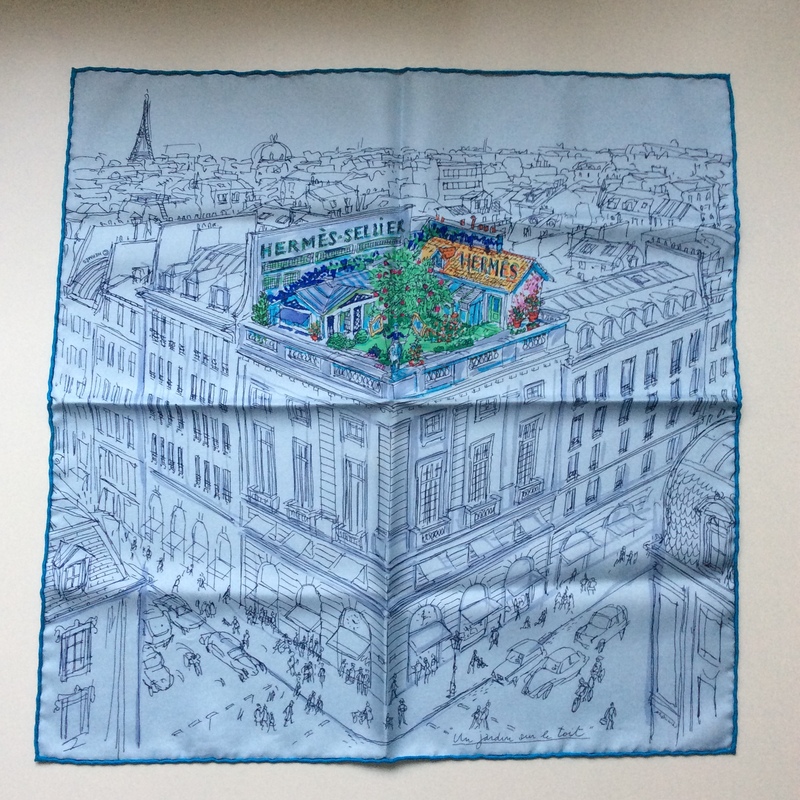 This entry was posted in Hermès and tagged Hermes, scarf collection, Un Jardin sur le Toit. Bookmark the permalink. I did visit the restrooms (so I didn’t lie) and I may even have had a snack (which I forgot to mention). ..
Tying a scarf is essential to know how it will look, you are right, with this design it is completely different open vs folded. annemariec is so right. It’s really helpful to see pics of the scarves tied. That’s how you wear them afterall. It makes such a difference. Do you tie them and try them on in the store before purchasing? I really like the circuit scarf and can well imagine how versatile it is, while the Jardin scarf will always have that special perfume connection for you. Fab. The Husband covers himself in glory again, despite his attempt at mitigation! I agree, the circuit scarf didn’t appeal to me when flat but folded it’s lovely. And with the jardin it’s a little bit the other way around. Being such a monochrome girl I probably would have preferred it without the colourful garden. I’m a philistine, forgive me. If I’m not mistaken there was a monochrome version available too, white background and grey drawing. Ebay can be a gamble, you can make a great deal or receive a dud. I hope for you it is the former. Let me know how your new acquisitions turn out! O.K, the feedback from my e-bay purchases- My four!!! amazing scarves just arrived! In superb condition and amazing colors (one is decorated with perfume bottles, another- with pumpkins :)))) I’m so delighted! These were good bargains. And you got the perfume bottles! Excellent choice. Have fun with your scarves! I’m not sure why I’m so drawn to the Circuit, but the 3D effect might play into it. I have always loved the way you wear your pochettes. These are beautiful. WOW again. Love the scarves but the stories are even better. That husband of yours is amazing. Thank you for the scarf plus story idea, I love to reminisce about the story behind every one of them. Half the joy of owning anything is the story of the hunt and purchase and the memory each time I see it. It makes it very hard for me to part with stuff because almost everything I own has some connection. Yes, I am slowly learning this but that doesn’t help the wrench when you let stuff go. That’s why we do massive clean outs, so the pain is big but quick. I’m the same, but sometimes the cleaning bug hits and thing HAVE to go. I also liked the rooftop scarf best. The thing I like about Hermes scarves is that many could be framed and hung on the wall. They are like little works of art. I also like that the garden is in color while the rest isn’t. Kandice, sometimesthere is a scarf that I seriously contemplate hanging on a wall, they are indeed works of art. I’m thinking if showing different ways of tying in the course of these H posts. With your extensive scarf experience, would you be willing to post on your opinions regarding scarf colors and what is complementary with what skin tones and hair color? Also, scarf designs as they relate to body type? I would find that very useful. Thank you for considering this request! It is hard to give general guidelines, as this is – just like perfume – a highly individual thing. That said I am willing (and hopefully able) to give case by case advice, should that be requested. If you have a specific question you can also email me if you want to. I love both scarfs, but le jardin really speaks to me. It is beautiful. Also, I agree with Spe. It would be great to have some advice regarding scarf colors and how to wear them. For instance, what is the best way to tie them. From now I will include a few shots of different ways of tying with each scarf I present, so you get an idea what it looks like. For some reason the Circuit 24, Faubourg scarf speaks to me the most (open or folded). The other one is quite lovely too, of course, with its Paris view and the tie-in to the perfume, but I think that chain print is stunning and reminds me of a good piece of heavy yet elegant jewelry, like a chain cuff bracelet. Thanks for sharing, Birgit – will look forward to the next edition! So happy you like Circuit as well, Suz. It is so simple but so powerful. 🙂 I like the chain d’ancre, but I never liked the circuit when laid out flat. It looks completely different when tied. That’s the thing with all Hermès scarves. What looks laid out flat beautifully, might not appeal when worn around the neck. So it’s essential to try it on and fold it in many different ways when purchasing. Looking forward to more of your scarf collection! Thanks for reading, happyface! Have a lovely weekend! I love the scarves, and I especially love that they have stories behind them. It is indeed interesting, as happyface313 remarked above, how different the scarves look depending on how they are tied! Thanks Nemo! Glad you enjoy this. I’m apprehensive since it is a long way from perfume, but it seems that people like these posts too. Both scarves are just so nice. I find the Cicuit one looks most versatile, and I guess I would have bought a rather monochrome scarf had my budget allowed a purchase at this time. Today I am enjoying one of the cheaper items from the same house: L’ambre des merveilles, such a good perfume on a cold and windy day. I need 3-4 sprays to get the warm feeling, so luckily I opted for a large bottle of this. Not too happy with the bottle design, it is too large to fit my hands. L’Ambre is lovely, but I agree anout the bottle, it is pretty but a tad impractical. Glad you like the scarves! 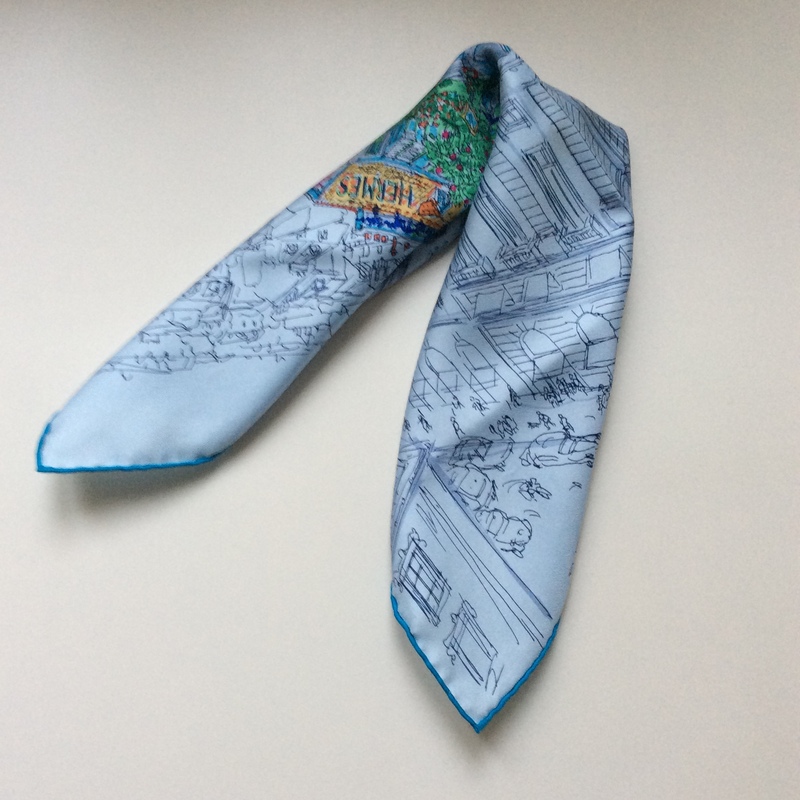 Love the elegance of the scarves, but the Jardin scarf is so beautiful with the splash of colours and the whimsical lines of the cars and pedestrians etc. Also, what a gorgeous shade of blue! The husbs sounds great by the way – a keeper!! Oh, I see marjo56 is also interested in tieing techniques! I actually own the Circuit one in the same color! Blue is a favorite color, the Jardin looks very pretty as well. Hum. With all my respect to you as a perfumista, I cannot get this passion for Hermes scarfs. I adore silk per se. 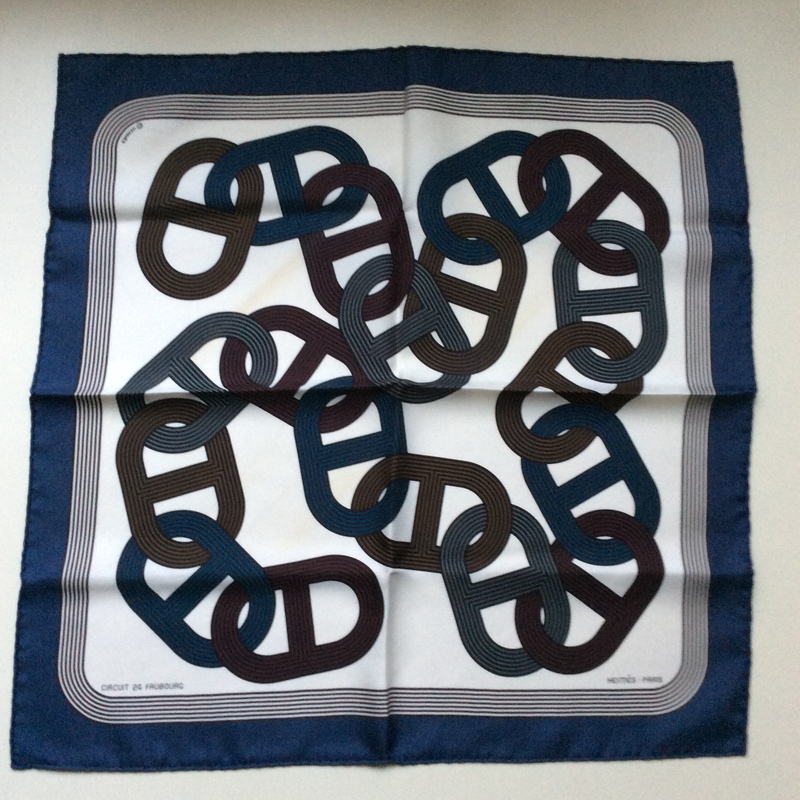 But Hermes scarfs with their riducuous mini sizing, even if 90×90, looks to me so a superficial object. For some, maybe very personal and highly idiosyncratic reasons, I associate those scarfs with women who judge others according to their appearence, the next worse thing to this would be the kelly hermes bag (or louis vuitton stuff). The statement is: I am (a little bit) the money ((c) Casino Royale). But it is just an opinion of someone wearing at most 2 colours at time (mostly rick owens). But to contribute to the discussion — if chosing between “circuit” and “jardin sur le toît”, I prefer the latter — less oldish, even if it ends up looking like an advertising scarf given for free for buying the fragrance. PS: really don’t take it personally, I just cannot stand hermes scarfs. Wow, that is a topic that must really irk you. My solution would be to ignore these posts instead of leaving hurtful comments on them, since it saves us both the emotional upheaval. Also adding “it’s not personal” to a scathing opinion does not make it less so. But I’d still like to end this in peace, superficial show-off that I may be, I value my blog as a friendly place for all. Have a good day! Imagine if I have written here a negaive post about a perfume that I cannot stand (e.g. coco chanel, or for a more extreme example lady million paco rabanne) — that would have been tolerated? But it is just my same opinion as my opinion about a hermes scarf… Hugs! It is kind of hard to not take that personally though, since it was me you called a boring petite bourgousie show-off. But as far as I’m concerned it is water down the bridge, life is too short to fret about it. I’m glad you are enjoying these posts, rickyrebarco.